Burton Leonard WI members decided that it was high time we made an effort to do our bit for Denman. Coffee mornings are always popular in our very community-spirited village so to hold one seemed the ideal way to raise some much-needed funds for the appeal. We set about advertising the event, which was to take place on Saturday morning 11th March, by designing a poster and an item for the village magazine. We would be offering the usual sumptuous WI bakes, coffee, an excellent raffle and great company of course! However a very unusual and innovative idea was to come to us, inspired by our Zumba teacher, Lidia Kendall Miller. 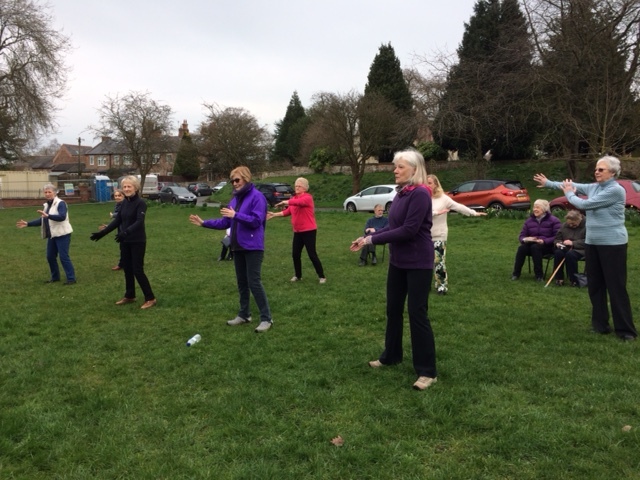 She suggested it would be extremely uplifting and enlightening for an audience if we were to perform ‘Qi Gong’ (gentle and meditative exercise) on the village green. Those of us who attend her class on a Monday morning excitedly agreed to give a ten-minute performance before refreshments were served in the hall. Fortunately the day dawned fair so, dressed in our finest fitness gear, we posed and stretched to impress! On hearing the beautiful music and Lidia’s calming voice, many villagers gathered to find out what was going on and a few even joined in! We’re not sure that extra money was raised due to our demonstration but we certainly loved communing with nature in this way and introducing something completely new to the village. As well as having a most delightful morning we were able to donate £153.70 of our takings to the Denman fund (the remaining £150 went towards Village Hall renovations) of which we are all extremely proud!